Grape stomps. 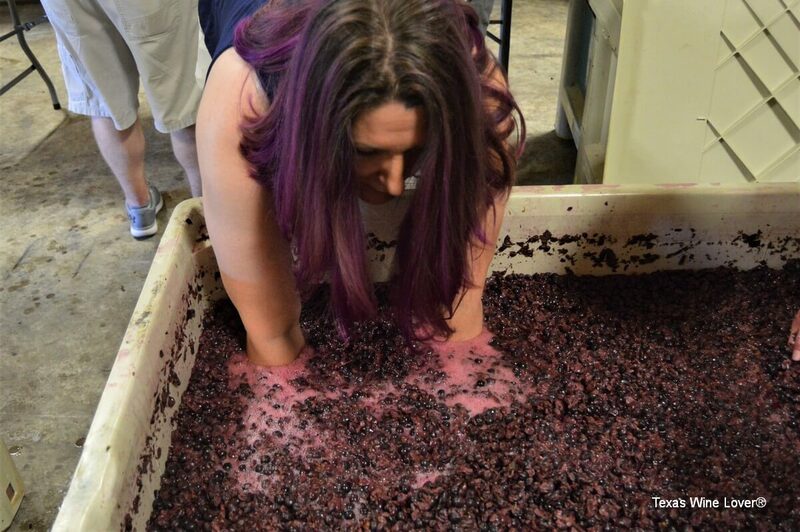 As harvest gets going, more and more wineries have grape stomp events. Many have large parties where people come to get their chance to stomp grapes. There is a barrel, or something similar, with grapes inside. After stomping for a bit, most place their footprints on a t-shirt to remember the occasion. I have quite a few t-shirts with faded feet or hand stains. 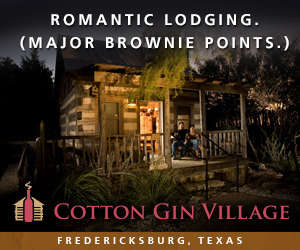 Lately, wineries are moving to more unique experiences. 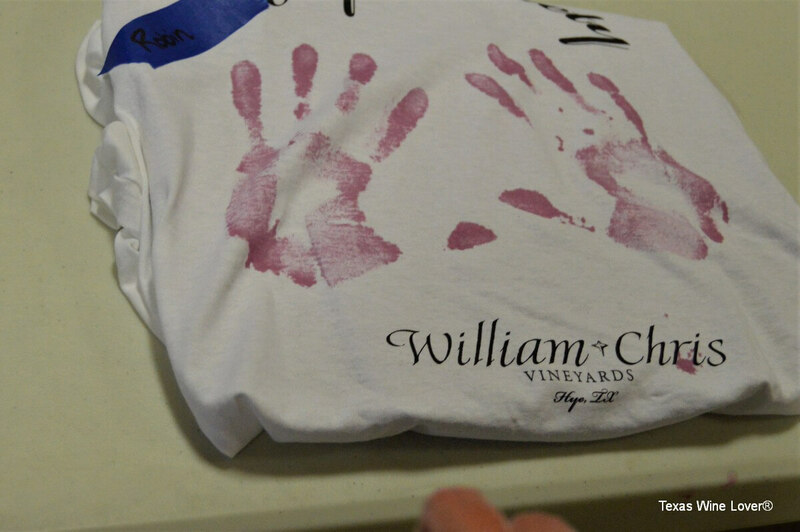 William Chris Vineyards started their Grape Punch several years ago to do something more memorable. Recently, I got the chance to punch some grapes with them. The grape punch is a ticketed event. They have multiple times and days to choose from. They limit the number of spots to keep each session small and intimate. The event combines education with harvest fun. We arrived a bit early, so we lounged in the shade near the sign-up—which was clearly marked. We did not wait long before some of the crew came to get started. Upon sign-in, we picked our shirt and put our names on them; they are prepped and moved into the room where the punch takes place. 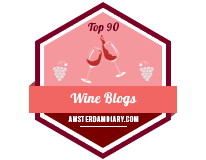 Since we were early enough, we got to enjoy a glass of wine, and we could not resist the call of the 2016 Hunter. At the start of our session, Chris Brundrett came to greet the group. He looked tired, but still had his trademark smile and enthusiasm. 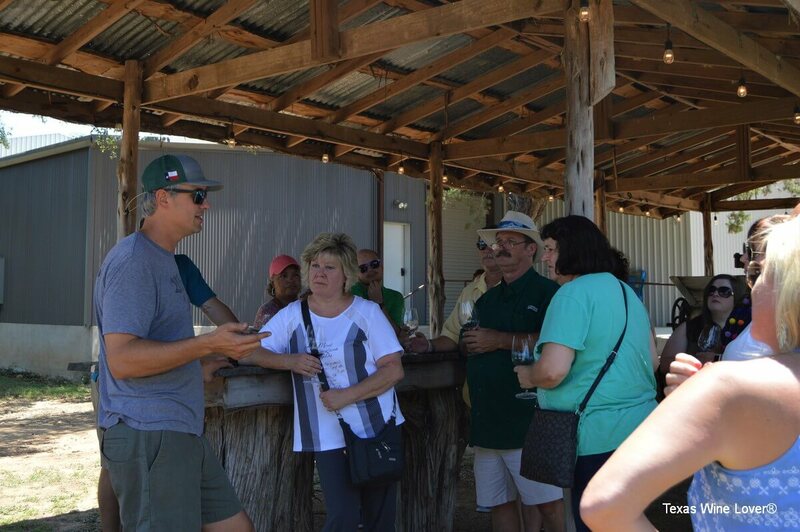 He talked a little about the winery and the evolution of the grape punch. 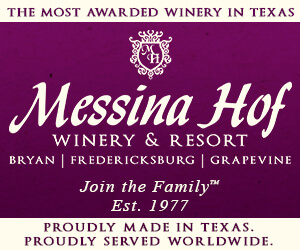 The winery began with 400 cases from the 2008 harvest, and now they produce about 35,000. 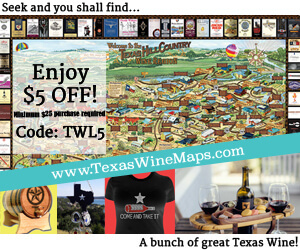 That is a good fit for them, as they prefer selling most of their wine through the winery and wine club. Some wines are found at select retailers and restaurants these days, and a few of the wines are now at Whole Foods and Central Market. 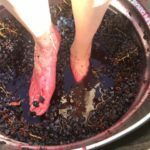 When the winery got started, they did the same sort of grape stomp everyone else did. In those days, they would acquire some grapes not intended for wine (later in the day, I found out that Jason Cook of Hye Market supplied those grapes). Guests would get into the grapes and stomp, and they would finish with their footprints on shirts. I remember one of the last times they did that; I volunteered one afternoon. However, Chris just did not like that. It was impersonal and not particularly memorable. Then they came up with the grape punch. 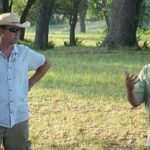 Instead of a boring event, they decided to personalize it and bring the guests into the winemaking process. With smaller groups, they could focus on education and share the excitement of those participating. 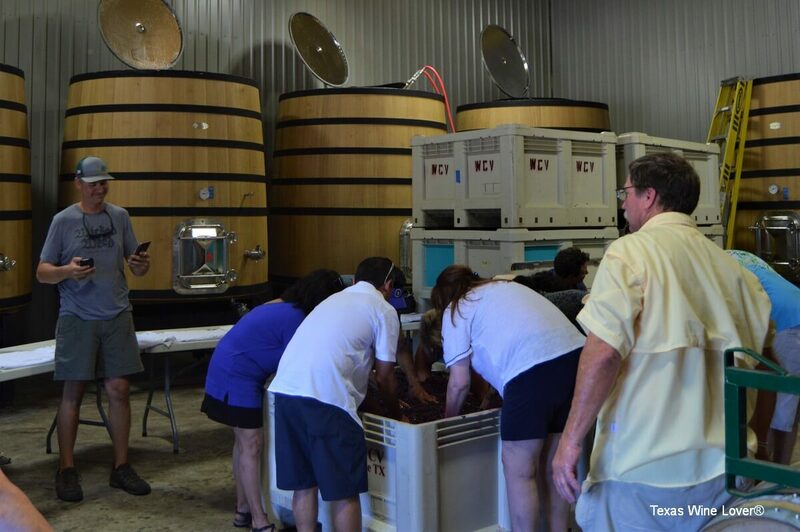 The guests actually get to take part in the winemaking process, making the event even more special for those involved. 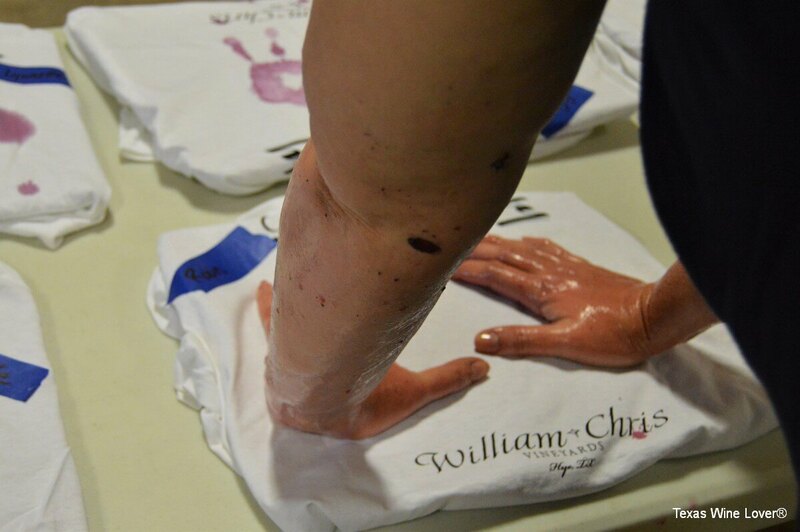 These days, William Chris would not have it any other way. Before we headed into the punch, Chris told us about the harvest—the reason he and so many of the crew are tired. This year marks their 11th harvest; the first was in 2008. And with each year, things just got bigger. By the time we visited in late August, they had already worked forty days straight and had another twenty ahead. At this point, they harvested two-thirds of this year’s. Our first stop was the crush pad to see sorting and crushing of a recent crop of Chenin Blanc. Chris brought around a cluster for everyone to try. This particularly crop was a small one for Rob Nida. 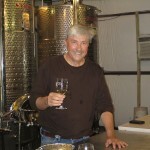 He is using the equipment at William Chris to work on wines for his own private label. Next, we headed inside to see the step after punch downs. We got to see the remains of the skins and seeds after pumping the juice into the waiting tanks. Then we headed to a tank room to see the fruit we would help punch. 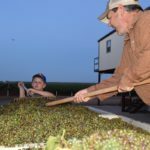 The William Chris Grape Punch is unique in that those attending actually help with the winemaking process. They have guests do punch downs on grapes currently fermenting. 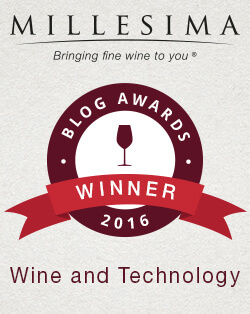 In our case, we helped with Sangiovese from Alta Loma Vineyard in Brownfield. 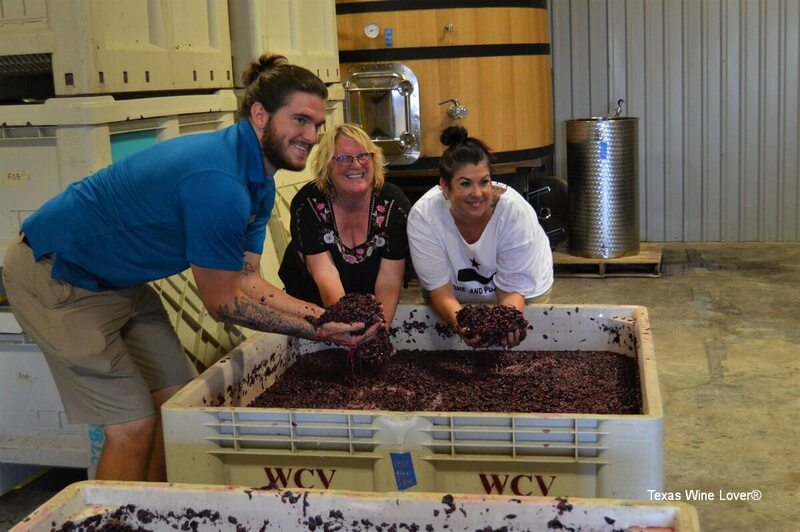 Before the punch down, Chris talked about winemaking, focusing on the punch down. Before we could get going, we had to get clean. Chris walked us through their process. They do a three-step process, and it was recommended to scrub up past the elbows. We started with hydrogen peroxide to remove dead skin cells. Then we moved on to citric acid to neutralize the process (it was at this point my husband Sean realized he could not take part due to his citrus allergy). We ended with a sulfite wash. Once complete, we got our hands dirty. During fermentation, grapes are punched down about three to five times a day. We took care of one of them for the winery. And if we got carried away and kept going, there would be no harm. In fact, Chris said the only way to mess up the punch is to not do it enough. The punch down is an experience for the senses. Before even getting dirty, we could smell the fermentation process as the yeasts did their work to convert the sugars. It is not a particularly pleasant smell, but it leads to big and better things. The grapes are squishy, but the cap that we had to push down through has a bit of resistance. As we punched down, the mixture gets less solid, but grapes and their seed still float about. All the while, there is heat; the yeasts are working hard. The punch down process works to get oxygen into the juice. This is evident when foam develops on the cap. The foam is the yeast doing its job, and a good sign. While we provided some free labor, the staff took pictures with everyone’s phones. Of course, I had my own photographer. We were allowed to keep punching down even after pictures. Once we felt we were through, we headed over to our shirts, which had been brought inside and neatly laid out, and left our grape-stained hand prints. Finally, we headed outside to get a thorough rinse off. After the punch down, the shirts are left in the sun to dry. To pass the time, we had a tasting. Luckily it was reserved in advance because they were booked. 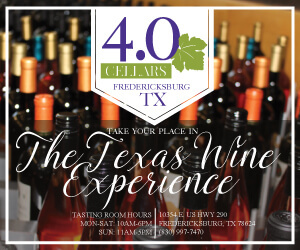 Of course, if we did not have a tasting, we could sip on wine and listen to the live music instead. Janice took us through the current menu. 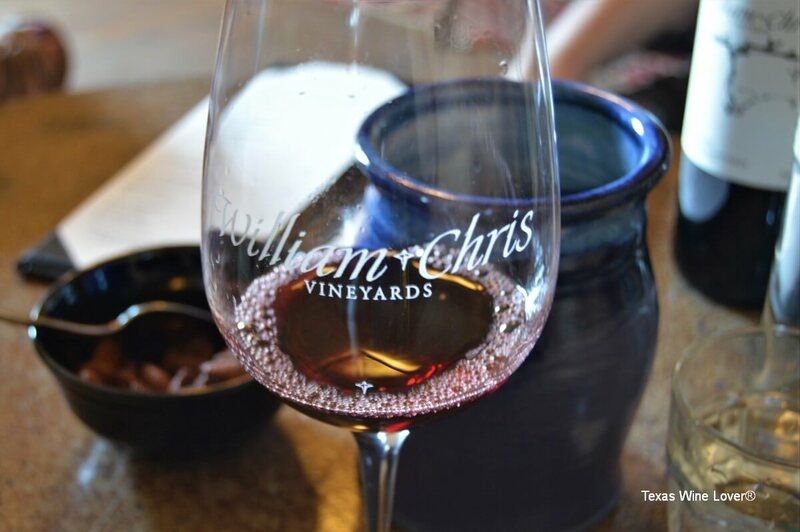 As always at William Chris tastings, we learned about the vineyards and, in some cases, the history of the wine. After our tasting, we headed outside to find our shirts dried and ready to go, a souvenir of our hand in the 2018 harvest. 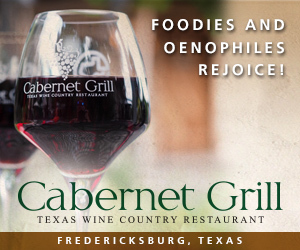 Whine Adventures: Texas Grape Harvest Season – Fun for the Whole Family! 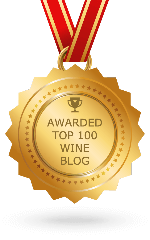 Fruit of the vine… And it is sweet!